BBQ Shrimp Kabobs w/ Street Corn — Happy Food Co.
LIGHT the grill to medium-high or pre-heat the oven to 450 degrees. RINSE shrimp under cold water and drain in colander. MIX the shrimp with shrimp seasoning in a medium bowl. POUR the mixed veggies in another medium bowl and coat with balsamic vinegar and olive oil mixture (shake mixture well to combine and if it has solidified, place container under hot water). 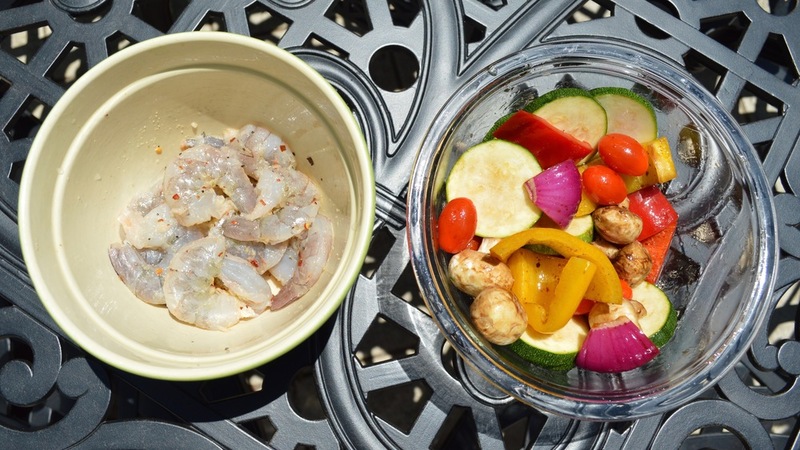 SKEWER the shrimp and veggies. ★TIP: Extra skewers are included so you can use any combination of ingredients! GRILL (Chef K Recommended): Arrange the kabobs in rows on the grill. Place the corn on the grill. Grill for 5 minutes, turning once. Remove kabobs and turn corn. Cook corn for 5 more minutes. OVEN: Place kabobs and corn on foil-lined baking pan, and bake at 450 degrees for 5 minutes. MELT butter over corn and sprinkle with tajín seasoning and salt to taste. SERVE the kabobs with bbq sauce and an ice-cold brew. Enjoy! Vibrant rosé with delightful floral aromas and red fruit flavors of strawberry, raspberry and cherry with a hint of spice.